Creams and serums applied to the face only go so far. It’s the same thing for makeup. You can only cover up so much. And actually, there are far better things for your skin than make up. Diet is the most important one. Diet works from within. All your cells on the surface of your skin are pushed up from the bottom layers. Thus, what you are looking at in the mirror is the results of feeding the cells from within about three to four weeks prior. You can do an experiment on yourself. Eat every processed food and sugary delight you can find for three days. Don’t drink enough water on those same days. Photograph your face every day in the same lighting at the same time. Then look at the results. You’ll clearly see a big difference in how you look. So if you want to look good on the outside, you must make the changes from within. The old adage “you are what you eat” demonstrates all its power as we grow older, unfortunately – and you can’t escape it. We live in a time of plenty. You actually have many good choices for healthy foods. And these healthy foods will alter the quality of your skin. In this article, you’ll get four foods, plus alternatives to expand the list. All berries are excellent foods. 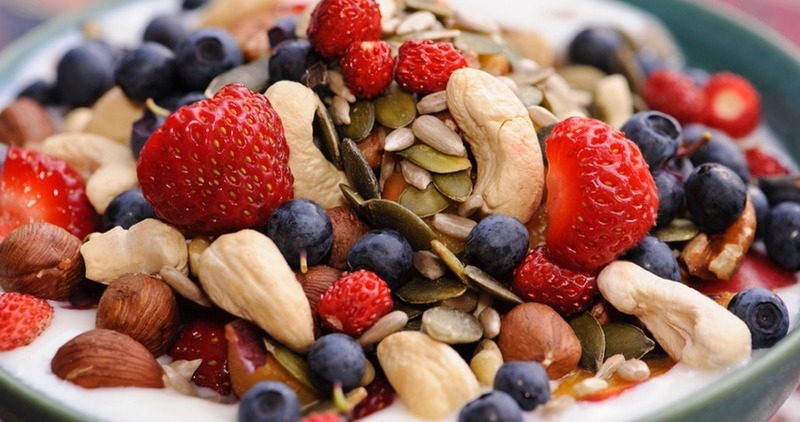 Some experts say that berries can help you reduce high cholesterol levels. Because berries are great sources of immune-boosting vitamin C, they’re a good food addition to the diet of all those with diabetes. Diabetics need extra help with boosting their immunity. The extra vitamin C is also exceptionally helpful for preventing cancer. As an antioxidant, vitamin C will reduce the number of free radicals in the body. Free radicals are what causes wrinkles! This is why the vitamin C serums are so popular for wrinkles. What type of berries should you eat? Blueberries, strawberries, raspberries, and blackberries, and even gooseberries or goji berries if you can find them. In fact, why stop there with eating berries? Use the berries to make your own beauty mask at home. If you’re strapped for time or cash, you don’t have to go to the department store for berry beauty. 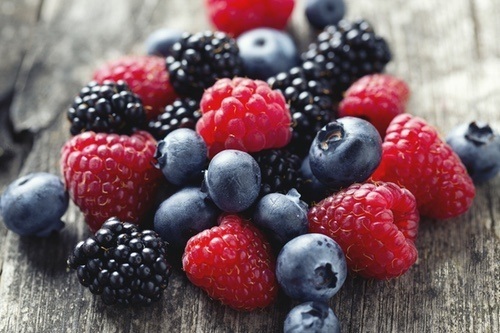 Try these three DIY treatments to get the great skin benefits of berries at home. Just be sure to use organic ingredients. Anti-aging mask: Mash up a handful of raspberries with a spoonful of honey and apply the mask to clean skin for 15 to 20 minutes. Rinse and pat dry. Cranberry face scrub: In a bowl, blend 1⁄4 cup cornmeal, 2 tablespoons freshly crushed cranberries, 1 tablespoon buttermilk, and 2 teaspoons honey with a fork. Massage onto your face and neck for 2 or 3 minutes. Rinse with lukewarm water. Apply to clean, damp skin once or twice a week. Nuts are underrated as nutritious snacks. Walnuts look like little brains – and this is a clue as to how they can help improve your health. Your brain needs omega 3 fatty acids, and walnuts are high in these good, healthy fats. Omega-3 fats are also inflammation busters – and inflammation causes pain in the body. It also prevents you from healing completely if it continues for a long time. Did you know that almonds are quite high in fiber? With only 2 ounces of almonds, you will get 6 grams fiber, or 20% of the day’s fiber you need. And that helps your colon. Almonds have another benefit for the gut – they bring in good bacterial flora to the gut so it can work properly. Studies also show that by adding almonds to a meal, you can have better control of your blood sugar levels. Only one ounce gives you about 25% of the magnesium you need for the day. Magnesium helps keep you calm, and prevents muscle cramps and uncontrollable twitches. Your brain also benefits from magnesium. Cashews are also a good source of zinc, a mineral needed for a properly functioning immune system. Statin drugs aren’t as good as pecans when it comes to lowering cholesterol levels. One study found a drop of cholesterol by 33% from eating pecans every day. Pecans are also high in vitamin E which quenches free radicals in the body, and keeps cholesterol from oxidizing in the body. Another good benefit! Even the American Cancer Society admits that a selenium deficiency is a cause of cancer. Brazil nuts are your insurance against a lot of cancers. Each Brazil nut contains about 50 mcg selenium, so only a few per day are all that is needed. Macadamia nuts are nuts are similar to olives in that they are high in monounsaturated fats, according to researchers at Pennsylvania State University. They also lowered cholesterol levels. If you want to sneak a special snack when you’re on a diet, go for the pistachios. 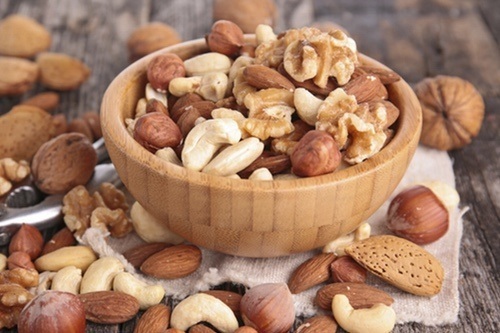 Fifty nuts provide you with about 160 calories, plus lots of vitamin E, potassium and vitamin B6. You can easily work off 160 calories! Hazelnuts are often found as a flavor in coffee but they’re good for more than that. Your HDL-cholesterol levels protect you from heart disease. Raise them by eating an ounce of hazelnuts a few times a week. When you have enough omega 3 fats in the skin, your skin won’t wrinkle. Use the best type of salmon – Wild salmon, not farm-raised. Salmon is one of the best food sources for omega-3 fatty acids, which helps keep your skin supple and moisturized. 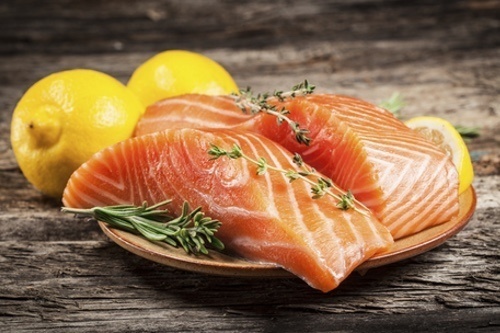 Salmon also contains selenium, a mineral that protects your skin from sun exposure. And if you eat the bones of salmon such as the ones found in canned salmon, the vitamin D in them will keep your bones and teeth strong and healthy, too. Adding salmon to your diet is easy since there are hundreds of ways to enjoy this beauty superfood. Try it grilled, baked, in your pasta, with a salad, in sushi, or just with a side of asparagus. There are many benefits of oily fish like salmon, mackerel, sardines, anchovies, herring, and trout. The essential fatty acids in these fish are vital for our health and have reduce depression, balance hormones, reduce inflammation, lower blood pressure and cholesterol levels, and improve behavioral problems in children. 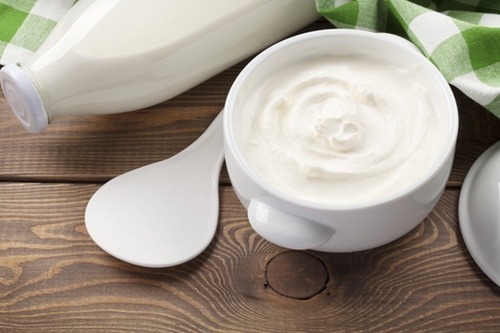 Yogurt and kefir are high in probiotics, which are known to reduce inflammation and oxidative stress in the body. Probiotics aid in digestion of food and help you absorb nutrients and minerals. They contribute to glowing and beautiful skin by permitting the body to assimilate skin friendly nutrients and fats. Probiotics strenghthen your immune system by protecting against infectious and inflammatory disease. They contribute to your overall wellness, including skin health. Many factors contribute to skin aging and wrinkling. Environmental toxins and disease can damage the skin, weakening its ability to repair itself. UV radiation in sunlight causes photo-aging with resulting age-spots and wrinkles. The collagen and moisture levels contained naturally within the skin reduce with age, causing sagging and wrinkles. Aging is inevitable but aging beautifully is possible with a diet rich in good fats, antioxidants and devoid of fried and processed food. Try these suggestions this week.